When baking pizzas, it is important to have a sturdy surface on which to bake the dough. This is especially true if you are baking on modern pizza ovens and are in the process of trying to compare pizza stones. The reason for this, you ask? Most of these ovens do not reach temperatures high enough to cook the dough in an even manner. If you are trying to create the perfect dish, it is imperative that you invest in a good-quality stone. We picked two products worth your consideration: Pizzacraft Rectangular stone and Heritage 15” Black Ceramic stone. These two are some of the most well-known products on the market right now. 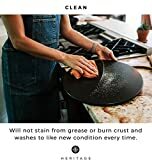 In order to help you buy the best baking equipment, let us compare pizza stones from Pizzacraft and Heritage in a comprehensive manner. Both brands are well-established. However, as evident by the brand names themselves, they have rather different product focuses. Pizzacraft is well-known among pie makers for creating tools and equipment specifically geared towards pizza baking. Heritage Products, meanwhile, create a variety of kitchen tools. Let us begin by first enumerating each product’s features and specifications. This will hopefully provide a clear overview before we proceed to compare pizza stones from these brands. More importantly, there are several key differences between the two products. We will be discussing each of these aspects to fully compare pizza stones competing for the best baking surface title. The difference in shape is noticeable from the get-go. The Pizzacraft model is rectangular-shaped, while the Heritage one has a circular form. Thus, this aspect will greatly affect the shape and size of the outcome. While both products will be able to accommodate different shapes, it cannot be done without compromising on the size of the dough. It would be fine if you are willing to work around the problem. After all, it ultimately depends on your preferences as a chef. Traditional Neapolitan pizzas often favor a circular shape, for example. The best thing about this type of pie is that the crust is well-distributed among all slices. Square pies, meanwhile, are great for snacking with a large group of people. This is yet another thing to consider when we compare products. Mainly, there is a difference between the material used in the creation of these products. Both are ceramic, but it is important to note that Heritage variety uses regular ceramic and the Pizzacraft one uses cordierite. In this aspect, cordierite is the clear winner. The mineral is well-known for its thermal shock resistance. Ceramic is strong, but it might not last as long as cordierite. If handled improperly, you might even break it after the first use. Regardless, both materials are well-known for fragility. This means that if you drop these model types, they will probably shatter. Thus, certain steps must always be taken if one wants to increase the overall longevity of the product. When buying a stone, it is of utmost importance to consider the size of your oven or grill. After all, the main reason you are getting a stone is to use it with the cooking appliances. It would be highly impractical to buy one that is larger than what you could use. More importantly, the Heritage stone can accommodate circular pies of up to 15 inches. On the other hand, the Pizzacraft can fit 14-inch round pies. Additionally, the latter is also more conducive for rectangular Sicilian pizzas and it offers a more generous room for error. On the other hand, make sure to be familiar with the dimensions of your oven before you head out to buy a stone, pan, or steel. This can help save you money and time in the long run. Of course, you also must think about the size of the pies that you plan to make. Most people are not fussy about the physical appearance of their product. After all, it is only used as a surface for baking. However, there is no harm in owning a beautifully-crafted variation of the object. The model from Pizzacraft is a rather straightforward, no-nonsense object. The pristine white appearance is pleasant to look at. Though it has been created as a baking stone, one could also choose to use it for serving. However, the only downside is that it is quite heavy. Furthermore, the color allows a person to notice any form of burning right away, which can be either a pro or con. On the other hand, it is undeniable that the Heritage stone is a thing of beauty. The polish of the black ceramic will certainly catch the attention of others, especially when the pie is served on top of it. However, do note that it can make the process of cleaning up more challenging since the color covers up burn stains. The upside is that the stains will not be very noticeable. The two products are similar when it comes to pricing. There might be a couple of dollars’ worth of difference, but it is quite negligible. It is on the low end of the spectrum, which is great for beginner chefs or hobbyists. Both are great investments, especially if you plan on getting multiple copies of the products. It was not easy to compare pizza stones that are both popular and well-liked in the industry. However, there are significant differences between the Pizzacraft Rectangular Stone and Heritage 15” Black Ceramic Stone. One can say that both are high-quality products with different priorities. Thus, it is difficult to declare a clear and objective winner. A lot depends on the preferences of the chef who will be making the dish. If you value thermal shock resistance, you can’t go wrong with the Pizzacraft Rectangular Stone. However, it might be less convenient if you plan on making circular pies. On the other hand, the Heritage stone is made of regular ceramic. Therefore, you will have to be more careful than usual, but it is efficient and stylish. Additionally, you will also get a free pizza cutter with the package. A stone can help one achieve the perfect crispiness and texture. It might not be the only factor to consider when making pies. But, it can indeed create a significant difference. A great stone is going to be an excellent investment, especially if you are planning to bake other dishes.